Celebrity Cellulite - Which Stars Have Cellulite? For many women, cellulite is the most dreaded word in the English language. These fatty deposits deep under the skin cause unsightly dimples primarily around the stomach, thighs, and buttocks. Women, and even men, are willing to try just about anything to get rid of cellulite. Cellutone is one of the products we reviewed. Our panel looked at the effectiveness of Cellutone, along with ingredients, price, and final results. Read on to discover what we found. 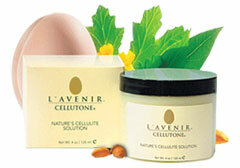 Cellutone is a cellulite treatment cream manufactured by L'Avenir. The name of the company was the first thing about Cellutone that made us suspicious. Many people have an ingrained perception that the French make the best cosmetics and beauty products. And though that might be true in some cases, it's become a trick some companies use to make their products seem more legitimate. L'Avenir certainly sounds French, but they are, in reality, a small company based out of New Jersey. Cellutone claims their wondrous cellulite cream works with their patented Ovasome Technology. It turns out, this is just a fancy way of saying Cellutone contains whole eggs in the formula. Since we had never heard of eggs being an effective cellulite treatment, our curiosity was further piqued. Sweet almond oil - beyond providing lubrication, does nothing. Triethanolamine - a chemical to reduce acidity and balance pH. Glyceryl stearate - another emulsifier. Cetyl lactate - considered safe for cosmetic use but can cause irritation. Lavender oil - has many uses, but cellulite reduction is not among them. Geranium oil - smells nice. No other uses. Methylparaben - an antifungal agent. Sorbitan Stearate - another emulsifier. It's difficult to keep whole eggs creamy. Cyclomethicone - a form of silicone. Sambucus Nigra extract - used in Russia for congestion but it is listed as a poison to mammals. A blend of extracts - includes sage, cumin, caraway, parsley, cowslip, and grapefruit seed. None of these is known for any sort of anti-cellulite properties. Cellutone is sold via their website and is also available on several affiliate sites. Pricing starts at $79.99, which is quite steep for a fragrant egg cream. They offer a 14 day risk-free trial but if you do not specifically call for a return authorization within 14 days, you will be charged $69.73. Beyond this first order, there are no other guarantees. Cellutone was one of the biggest jokes our reviewers came across. There is nothing in whole eggs that reduces cellulite. In fact, whole eggs cannot even penetrate the skin. If you still want to try it, we recommend going to the grocery store and spending $1.29 on a dozen eggs and you can do whatever you wish with them without it breaking your bank. For the best cellulite treatment that actually works (and is made with effective ingredients), read the rest of our cellulite cream reviews. ©2009-2019 CelluliteCreams.net, All Rights Reserved.